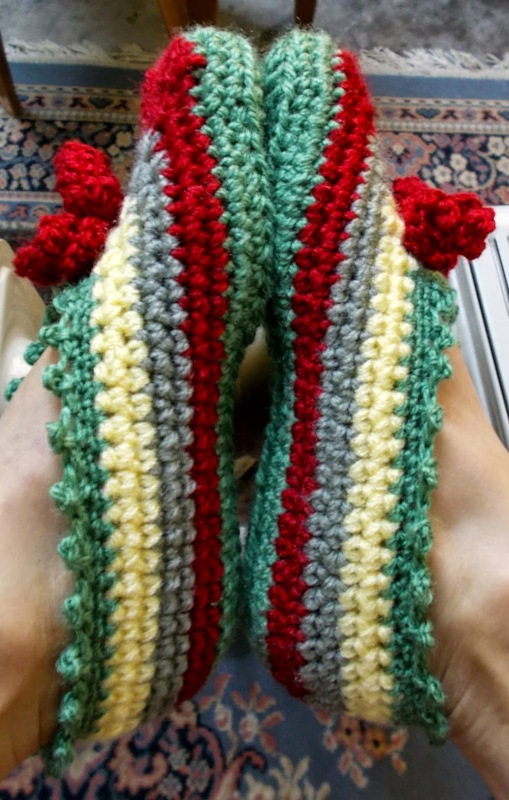 Winter is about to be over so I really made time to finish one of my first few projects in mind -winter slipper/shoe. Inspired by the pattern Pretty Pleats from freepatterns, I made one myself with a few modifications and I call it Stripes and Curls. The yarns are left over from previous projects and just like what the original pattern suggested, it is crocheted using two strands of yarns held together except for the edging (picot edging). I used two sizes of hooks: 5 mm crochet hook (sole, sides and trim) and 4 mm hook for the edging. The yarns are acrylic. I wanted to make the sole with a used/old slipper/shoe sole so I can use the shoes around the house but I couldn't find one around here so I went through with this project knowing I won't be using it except on the carpet or while sitting doing other things or watching movie or just blogging. 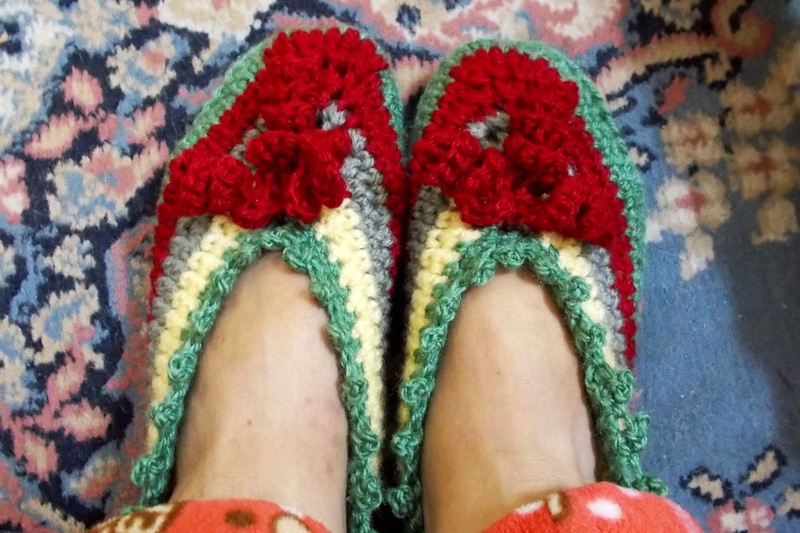 But I really wanted to make a slipper boot that I can use outside the carpet. And I am determined to do so! We'll see. It's warm and comfortable. The only modification I want to add is a strap from one side of the foot to the other so that it doesn't slip off or a set of cord or lace attached from the back to tie around the leg. I think that would help because right now it comes off from my foot. Maybe it's not well-fitting or it needs a few more rows up. I can't tell. But I believe this problem would be resolved with a strap or a lace. Whether you use plain or a combination of two or more colors is up to you. It's easy to make, just keep counting while crocheting. And make sure the strands are held aligned with each other. Iam Divanshu From Delhi .. i just love your products can i have your mail id or any point of contact please . Hi Divanshu, any inquiries can be sent to me through contact me page of this blog. Thanks for appreciating my work. I tried to contact but that page does not exist . Try the one on the lower left most section of this blog, you can write your message there! Thank you!